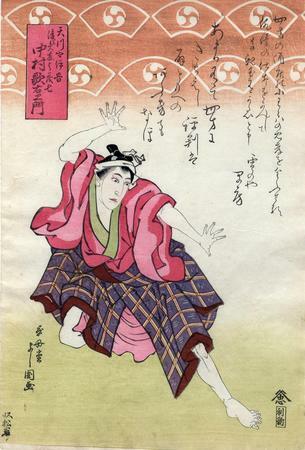 Although the plot for Ōishizuri sakura tanzaku (Ōishi's stone rubbing, a poem card, and flowering cherry: 大西摺桜花短冊) remains unknown, some role names (such as the virtuous wives Oishi and Osono, or Okaru's brother, Teraoka Heiemon) inscribed on prints by several artists for this production suggest that the story line was adapted from the most famous of all revenge plays, Kanadehon Chūshingura (Copybook of the Treasury of Loyal Retainers). Prints by Hokushū and Yoshikuni for this performance further identify Utaemon's role of the wine-shop merchant as amakawaya Igo (later called Yatō Yomoshichi). Utaemon also performed as Tashirō Yasubei (a.k.a. the servant Yasuke). Provenance: This impression is from the Haber Collection (illustrated in Schwaab, Osaka Prints, 1989, no. 50). Prints from this collection are admired for their fine color preservation, and often for their rarity, as with this design.